The Vyper x Helyx pups were born on March 31, 2016! 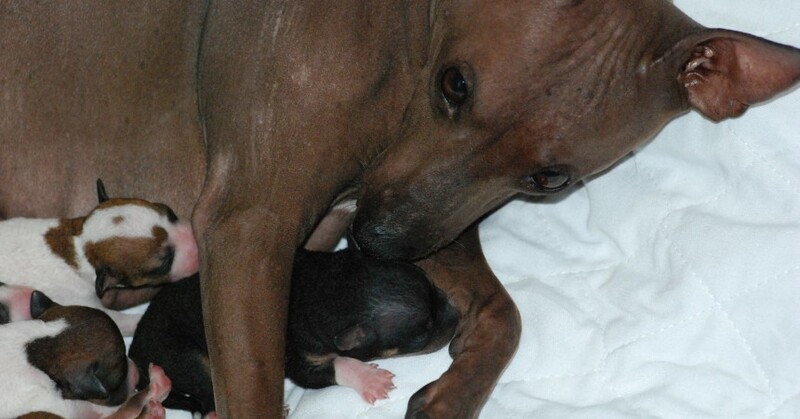 They had 5 beautiful pups: 2 girls, 3 boys, all hairless (of course). See the bottom of the page for pics of the pups! Vyper has her Grand Champion (GRCH) title in UKC and was also ranked in Top 10 – 2014 she ended the year 3rd and 2015 (with limited showing) was 7th. In AKC, she earned her Certificate of Merit (CM) when we were only in Miscellaneous. We became fully recognized in AKC in January 2016. 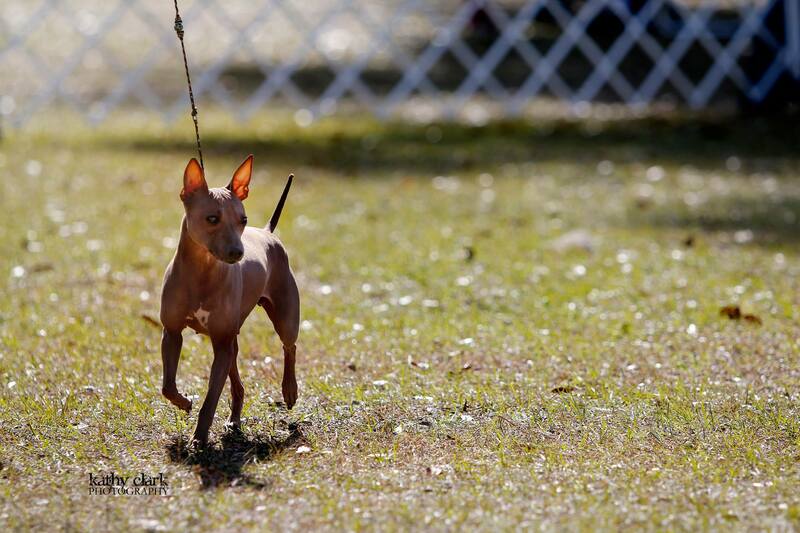 Vyper became the first hairless girl to earn her Champion (CH) title (the 2nd AHT in the breed’s history). Vyper then went on to earn her Grand Champion (GCH) title in AKC as well. 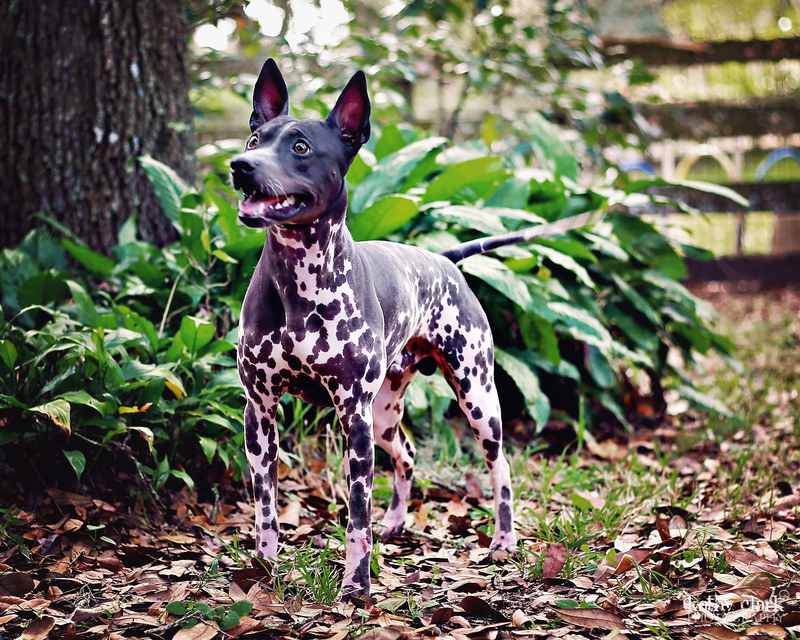 She was also the 2nd AHT to accomplish this (and only 3 total AHTs have earned GCH titles to date 4/2/16). Vyper isn’t only a pretty face She is also highly lure motivated and has her lure coursing title in UKC and a United Steeple Racing title too in Drag Racing. Vyper is structurally lovely, with a wonderful, gentle temperament. She has been the most terrific mom. We are super pleased with this beautiful little girl from Melissa Kidd! Helyx was born at our house to 2 amazing AHTs (Journey x Perry). He was selected as stud for this litter given his temperament, pedigree, and structure (complements Vyper’s structure beautifully). Like Vyper, Helyx has had a very successful conformation career. He has his UKC GRCH title and earned his AKC CM title very quickly with limited showing. Once we became full status, Helyx was the 5th AHT in the country to earn his CH title. He then went on to earn a GCH title – 3rd AHT overall (behind Vyper and his mother, Journey, who was the 1st). Helyx ended the 2016 AKC show year as the #2 AHT in the breed with limited showing and ALL exclusively owner handled. He has earned several Owner Handler Group placements, a Group 1 in Bred By Exhibitor Group AND most importantly a GROUP 1 (regular Terrier group) handled by Ryan! Helyx gets along well with everyone. He is a great ambassador for our breed. All of the pups have long found their FOREVER homes!! Another gorgeous WMK litter. Congrats!